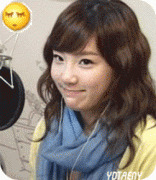 No doubt my #1 little lady has got to be Taeyeon. I don't even look at the girls here. They just don't interest me like that. I don't know what is, but just watching videos of her, looking at pictures of her, listening to her OST singing, ALL OF IT just gets me in the feels. I mean sure, I love the other Soshis. Sunny even sometimes makes it hard for me to decide, but, when it comes down to it, Taeyeon is the girl I dream of at night. From time to time, I honestly think I like "Love her" love her. Is that normal, creepy, or crazy? She's my perfect girl, and, if fate will allow, my future everything. Saranghaeyo, Taengoo-noona. Never met anyone like her. No idols behave like her. No idol has her personality. That's why she's the best and worthy. Are you talking about the group's leader, Taeyeon? it's hard for me to decide who i will pick since i like them all. My love is for Seohyun.